Hey hey, awesome bloggers. 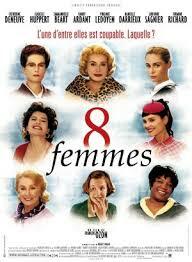 Check out my review of 8 Femmes for MovieRob’s June Genre Grandeur. It’s all about our favorite musicals this time. Thanks again to Audrey of 1001 Movies and Beyond for choosing this month’s genre. Next month’s Genre has been chosen by Ghezal of Ghezal Plus Movies and she has chosen the genre of Film Noir Movies. Try to think out of the box! Great choice Ghezal! Super excited about this Genre Grandeur theme chosen by Audrey of 1001 Movies and Beyond. We are reviewing our favorite musicals. Didn’t have to put much thought into what film to choose. It was fairly obvious. Thanks for reading! I adored this movie. What a host of fine actresses in a great tribute to Old Hollywood, with a certain spin too. wow, took the words outta ma mouth 🙂 Yes, this film is just filled with high-powered classic women and a great plot. I’m never tired of watching it. It’s a real pleaser of a movie and your review did it justice.